Thanks, it did turn out delicious! Oh, this is next on my list. Thank you. Looks great! Does this taste like amaretto or less sweet? Thanks! Mine is not very sweet because I added such a small amount of sugar. I think you could make this as sweet as you want. I added 1 1/2 TB simple syrup. I think you could start with just 1 TB if you didn’t want it very sweet (or even a little less I suppose) though I really though adding a bit of sugar brought out the almond flavor. Not because Halloween is coming does “Terrifying Green Black Walnut” sound good, but green black walnut looking schnapps itself. Thanks, it didn’t take too much sugar to bring out the flavor. Hope you give it a try! Started mine today. Gotta get some brandy to add to it though. Added brandy today and it already smells wonderful. Can’t wait for you to try this! Hope yours turns out as good as ours did! This looks really neat! My partner’s dad loves almonds. I’m thinking of making him this for Christmas. Thanks for sharing. Thanks! I hope you enjoy it! Always good to start holiday infusions now, as things tend to get so busy when we are closer to the holidays. I absolutely want to make this infusion! But I’m afraid it’s just too tight to make it before the holiday season…is it possible to double the ingredients initially and infuse it for 2-3 weeks, instead of four? You could try that. I would probably not use more than 1 1/2 to 1 3/4 c. Almonds, just to be sure your alcohol content stays high enough. 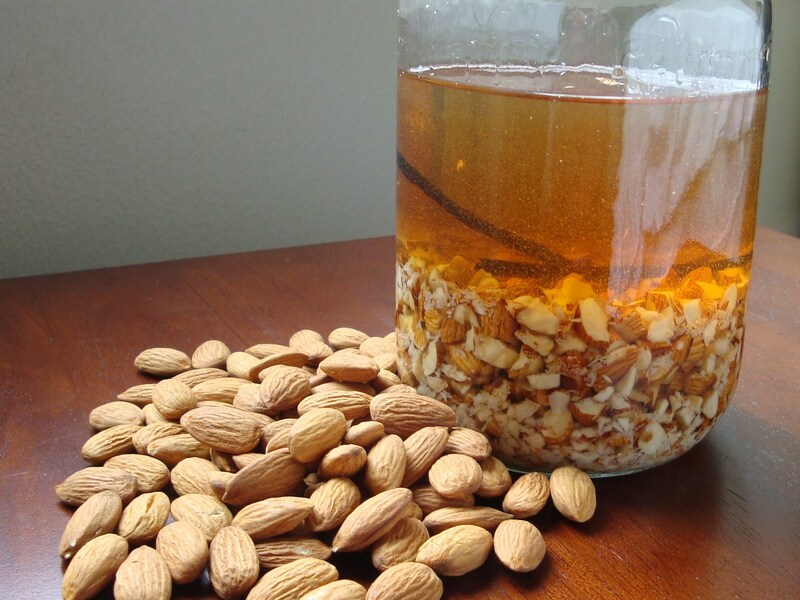 Also keep in mind that the nuts will soak up some of the booze, so the more almonds you add, the less liqueur in the end. Good luck! I think it will taste good. Let me know how it goes! Thanks so much! I’ll certainly be mindful of the amount of nuts that I add to this infusion. Has anyone else tried infusing it for less than 4 weeks? I just tried this, and it’s amazing! I actually chopped my almonds in the food processor, so some of them were basically powdered (makes the coffee filter step EXTRA really important! )… I’m not sure if the extra surface area helped or what, but I only infused it for 3 days and the flavor was perfect. Thanks for the recipe! Simple Syrup is sugar and water. I usually make a thick simple syrup by adding about 1 cup of sugar to 1/2 cup of water. Place the sugar and water in a saucepan on the stove. Cook over medium heat, stirring frequently. The sugar will dissolve, then eventually come to a boil. Boil for about 1 minute, continuing to stir frequently, then remove from the heat. Allow the syrup to cool completely before adding to the alcohol. You can add just a little bit or the syrup to your alcohol infusion, then feel free to bottle the rest of the syrup and store in the refrigerator for use in other cocktails or infusions. This looks great! Any suggestions for a Pistachio infused liqueur? Ooh! Pistachio liqueur sounds fabulous. I haven’t tried that yet but I really should! I would suggest roasting the pistachios, and be sure they do not have any salt. You could follow a similar recipe to this one and see how it goes.